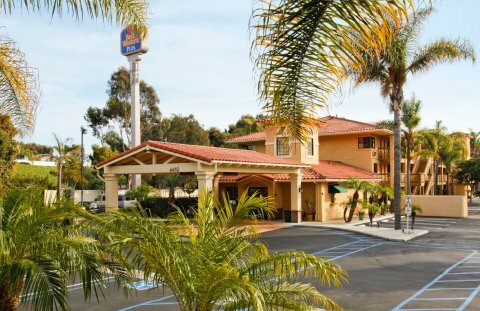 Welcome to the BEST WESTERN PLUS Otay Valley Hotel where gracious hospitality is a tradition. Travelers appreciate how our corporate atmosphere makes comfort and convenience a top priority. We are minutes from the Tijuana International Border. We are the closest hotel to Cricket Amphitheater and Knott's Soak City Water Park®. We are minutes to all of San Diego's attractions. We offer 118 beautifully appointed rooms (newly remodeled executive level) making us Chula Vista's best option for service, luxury, affordability and value. Our features include complimentary deluxe hot breakfast, business center with copier in the lobby, fitness center, heated outdoor pool with a spa, free HBO®, CNN, ESPN and Disney channel, fax, copy, and guest laundry available, microwave and refrigerator in all guest rooms. Business near hotel: Otay Mesa Industrial Parks, International Maquiladoras Manufacturing Zone, Panasonic, Sony, Sanyo, Samsung, Hitachi, Goodrich, Raytheon, Toyota.